Yesterday, the folks at HelloMotoHK gave us a look at what they described as the back cover to a new DROID phone from Motorola. This morning, they posted at even bigger image, this time with four different phone backs said to be of (in order, left-to-right) a new DROID Mini, Moto G (3rd gen), the DROID from yesterday, and the new Moto X (3rd gen). While we have no proof as to what any of these phones may or may not be, one thing is for sure, Motorola appears to have settled on a similar design theme for 2015. 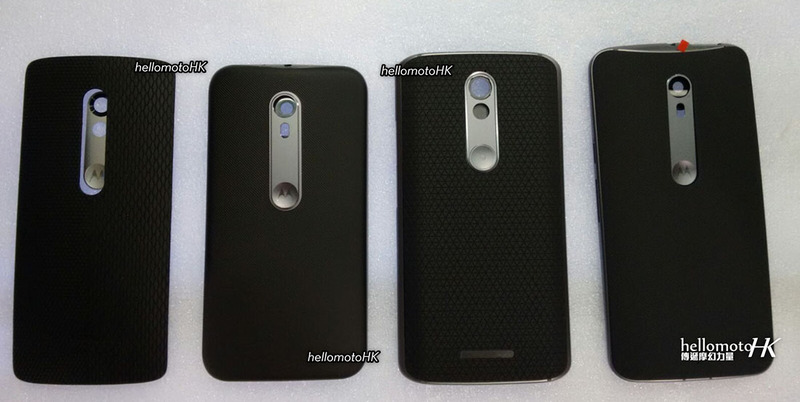 If we look to the far right at the phone said to be the next Moto X, we are certainly getting a phone that looks a lot like the last couple of Moto Xs, only with that new single metal piece that houses the dimple and camera. This is that design theme I was referring to that all of these phones seem to have in common. Outside of that, we are seeing a metal frame around the outside of the phone, along with that swooping boat neck-like top that features the headphone jack. The backside looks like a grippy matte black and the power and volume keys are in the same spot they were last year. That’s pretty much it. As for the new Mini and DROID, well, I don’t see how this “Mini” is any sort of mini. It looks to be the same size as yesterday’s DROID and bigger than what should be the new Moto G. Otherwise, it too has a design and texture on its back that could very well be something we would see in a DROID branded phone. With the supposed picture of the Moto G (3rd gen), we are seeing a phone that looks like the black version of the white model we saw leak a couple of weeks back. Overall, this style is familiar to the last couple of Motorola lines, so I wouldn’t say it’s disappointing or super exciting, either. I liked the last couple of Moto Xs (obviously) and wouldn’t be mad if this was the new version. In the end, all we really want us a similar Moto X to last year’s, only with a real camera inside. But then again, that’s always been the complaint about Motorola phones and they have yet to deliver.